Given my own feelings regarding Dragonlance, it's difficult for me to begrudge anyone who doesn't have much love for the Forgotten Realms. As an official D&D campaign setting, it's been frightfully overexposed since the appearance of its first -- and greatest -- boxed set in 1987. Then there are the novels, many of which are risible even given the rather low bar set by "gaming fiction." So, believe me, I get the dislike, even if I don't share it. 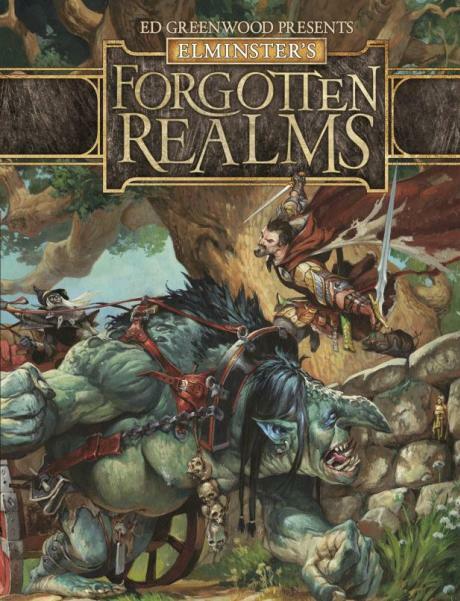 One of the reasons I don't share it is that I was a fan of the Realms (and of Ed Greenwood) for years before TSR decided to canonize the setting. One of the first issues of Dragon I remember buying was issue #62 (June 1982), which included the article "Pages from the Mages." The article caught me completely off-guard, since all it purported to do was describe four famous spellbooks, only one of which (as I recall -- correct me if I'm mistaken) contained unique spells. Yet, Greenwood made these spellbooks interesting by wrapping them in the history and lore of the Forgotten Realms. He showed that you didn't need to make a magical item more powerful mechanically to make it compelling. Instead, you needed to give it a sense of connectedness to the wider world -- one of many lessons he taught me over the years. It's that sense of connectedness that (for me anyway) has distinguished Greenwood's own Realms work from those of most other writers who've attempted to follow in his wake. It's also why I quite happily picked up my fourth WotC-published book of the year, the unwieldily named Ed Greenwood Presents Elminster's Forgotten Realms. This 192-page hardcover volume is a system-less "peek at the beating heart of the Realms, at what makes it work and seem alive." In practical terms, it's a collection of notes, musings, and memories written by Greenwood, in which he talks about whatever topics most interest him, including, yes, the lingerie of Faerûn (albeit very briefly). This is a book of pure "fluff," to use the unhappy term in vogue in some quarters, but it's delightfully fun fluff that rather nicely showcases the wild imagination of Greenwood himself. This is, in many ways, one of the most Greenwoodian of all Realms books, since it doesn't need to concern itself with presenting a ready-made adventure or a new spell or monster. Instead, it can focus on all those details, big and small, that Greenwood found himself wanting to talk about. And I can say, as someone who's played in a few scenarios refereed by Ed, that the book does a very good job of bringing the Realms to life in a way that's reflective of the way he runs his sessions. This is "Ed Greenwood Unplugged." In keeping with that, the book includes scans of Greenwood's original maps and typewritten notes from the old days, along with sidebar commentaries from him in which he reminisces about his home campaign. It's exactly the kind of thing so many of us wish we'd gotten from Gary or Dave -- a look "behind the curtain" of one of the great roleplaying game campaign settings. 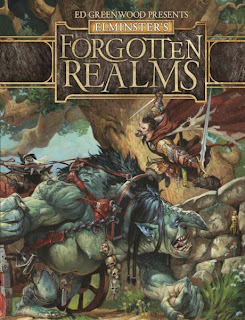 Whether one likes the Realms or not, it ought to be clear to anyone reading this book that the Forgotten Realms is the fruit of actual play and the product of a quirky, far-ranging creativity. Kudos to WotC for publishing and to Ed for having written it.